Backpacks were distributed via the Lorton Community Action Center (LCAC) for first to sixth grade children from local low income families. Pictured: Enola Thaboun (blue shirt, kneeling) and other volunteers pose with book bags they helped assemble for the Backpack Service Project. 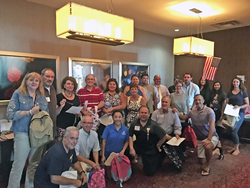 Andrews Federal Credit Union’s Enola Thaboun, Springfield Branch Manager, along with several other volunteers, collected and filled more than 70 backpacks as part of Rotary NXT Club of West Springfield’s Backpack Service Project. Rotary NXT is an innovative pilot program under the Rotary Club of West Springfield offering an evolution of the Rotary experience. They tailor meetings and service projects to active professionals who need schedule flexibility. Our core focus areas include networking, professional development, and service to the local and international communities. Andrews Federal Credit Union was founded in 1948 to serve the needs of military and civilian personnel by providing a vast array of financial products and services. With over $1.5 billion in assets, Andrews Federal has grown to serve more than 120,000 members in the District of Columbia, Joint Base Andrews (MD), Springfield, Virginia (VA), Joint Base McGuire-Dix-Lakehurst (NJ), and military installations in central Germany, Belgium, and the Netherlands. In addition, the Credit Union serves as a financial partner with many select employee groups in Maryland, the District of Columbia, and New Jersey.